First Lady Michelle Obama at the lauch of the Joining Forces initiative. Photo courtesy of the Joining Forces website. The medical colleges at the University of South Florida, Virginia Commonwealth University and University of Pittsburgh are among the 130 medical schools and research centers that committed Wednesday to creating a new generation of doctors and advanced research to care for military families and veterans. It’s the wellness part of First Lady Michelle Obama and Dr. Jill Biden’s Joining Forces initiative that focuses on the recognizing the sacrifices of military families. “I’m inspired to see our nation’s medical schools step up to address this pressing need for our veterans and military families. 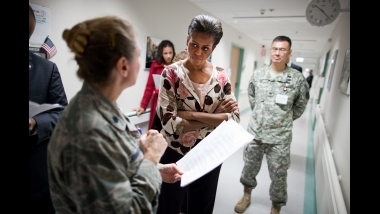 By directing some of our brightest minds, our most cutting-edge research, and our finest teaching institutions toward our military families, they’re ensuring that those who have served our country receive the first-rate care that they have earned,” said First Lady Michelle Obama in a White House Press release. The University of Pittsburgh where researchers are developing a new imaging tool that allows the visualization of the wiring of the brain in vivid high-definition, which could lead to new breakthroughs in the diagnosis of TBI. A full list of the universities and research centers participating in Joining Forces is available HERE.